Looking for a semester program with content courses taught in English and Italian language coursework at a beginner, intermediate, or advanced level? 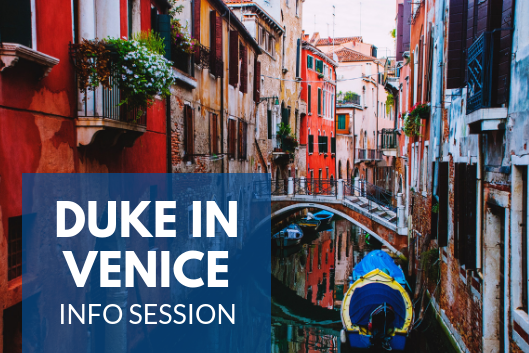 Duke in Venice offers courses for Duke credit in a wide range of subject areas. Duke in Venice students enroll in the Venice International University Globalization Program of the School of Humanities and Social Sciences. Attend the info session to speak with faculty about the program coursework and life on San Servolo Island!